We typically have two surgery clinics each week. On clinic days we may have as many as 25 cats in our cattery needing bedding changed (always a need for someone to fold newspapers to fit the cages) and providing food and water. Traps and trap covers need to be cleaned as well. The covers could be laundered at your home but the traps need to be cleaned and disinfected on site. Please check our calendar where upcoming events will be displayed. If you feel you have time to offer, please call us so we can schedule you for a specific time or task. This is where we set humane traps to capture the feral cats. We trap, neuter, and return them. This is known as TNR. We make sure the cats are being fed by someone in the community or by one of our volunteers. We try to provide insulated shelters to protect the cats from the rain and cold. We frequently provide additional medical care as necessary and we always get them a rabies shot. If you think you might enjoy the "thrill of the hunt" then trapping might be for you. Unfortunately, the time of day for trapping is often determined by the cats. If they are "night people" then trapping may be very late or very early in the morning. We have trapped sites where activity doesn't commence until 10 PM and may run to 2 AM. We would love to have you come out and help. 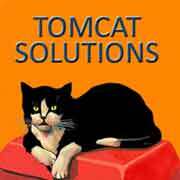 Fundraising events will be scheduled to introduce the community to TomCat Solutions and what we do. Volunteers will be necessary to man the tables and provide answers to the public. We explain to the public what we do, lend traps, educate about cat care and the importance of spaying and neutering etc. Our most common event would be a table at Petsmart or the local Farmers Market. We do a lot of fund raising as a non-profit organization. All of it goes back to the cats as we are an all volunteer organization. Our biggest expense is the veterinarian bills. We are constantly exploring new ways to raise money to carry out our mission to humanely reduce the cat population and to care for our foster cats. We also need people to help with grant writing and volunteers to shuttle cats to and from the veterinary clinic on spay/neuter day. We are often in need of foster parents. What is involved in fostering you ask? Fostering is when you let one or more cats live with you and your family. You love the kitties and take care of them. When the cat is adopted, usually our foster families take in a new cat to foster. It is the first step in trying to find permanent homes for homeless cats. It is work but it is very rewarding and a wonderful experience. Families can enjoy kittens or cats without the responsibility of medical bills and it shows children a way to be of service to their community and to learn kindness toward animals. If you are willing to foster for a predetermined amount of time, say a few weeks, that can be arranged as well. Hopefully we will be able to recruit enough foster volunteers to "rotate" the kittens. We also need donations of kitty litter and cat food (dry and canned). We appreciate any donation of any amount of money, time, or support. Go to our U can help page to make a financial tax deductible contribution through our fund managers, the Foundation for Community Partnerships.